What to expect during Services? ​When you enter the Sanctuary from the narthex (the hallway by the front of the building) you will be greeted and receive a bulletin. This includes the order of service and announcements of upcoming events. ​How Do people dress for Sunday morning? ​Holy Trinity is a pretty casual community where folks are invited to "come as you are." Children come dressed up or in jeans. Adult women often wear jeans, dress pants or skirt. Men often wear a button down shirt, but rarely a jacket or tie. ​You are invited to complete the Rejoice & Service sheet found on a clipboard at the end of every pew. We ask that you enter your name and let us know if you would like to be contacted or added to our email list. ​Typically all 3-year-old to 5th grade children attend Sunday School during worship. On the 1st Sunday of every month though, there is no Sunday School so children can worship with the large church "family." This service consists of camp style music accompanied by guitar and parts of the service are geared toward helping young kids in worship. ​The candle light service will be full. Plan to arrive 15 to 30 minutes in advance to find seating for large families. The nursery will be staffed from a half hour before and after worship. Children are welcome in worship. There will be 2 activity tables set up in the worship space for young children to quietly play. ​There will be an Easter Egg Hunt for all children & youth 30 minutes prior to the start of worship. 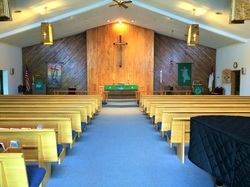 The worship space will be full, but large families should still be able to find seating together about 10 minutes before the service begins. Open communion will be available to all during the service. Please contact the church office if you are interested in providing special music for this service as we celebrate Jesus conquering sin forevermore! Join us for "S'more Worship" at our new Outdoor Chapel of the Cross next to the parking lot and woods the second to last Wednesday of each month during the summer. Following each outdoor worship, everyone is invited to fellowship and enjoy S'mores around the campfire. S'more goodies will be provided, bring your own beverage, bug spray and lawn chair. Folding chairs and a few wooden benches will be available if needed. All worshiping participants are invited to share Holy Communion with us regardless of what denomination you belong to or which congregation you attend, or even if you are not a church-goer at all, you are welcome to the table with us. When worshiping in the sanctuary, the ushers will direct you to the communion rail at the right time to receive communion by intinction. Intinction is when you are given a piece of bread to dip into a chalice of wine or grape juice. Gluten-free wafers and wine are available. blessing. Communion can be brought to you, if it is difficult to come up to the Communion rail. Children's Sunday School takes place during our Sunday morning worship at 10:00 am. ​ The first Sunday of the month is Family Worship. There is no Sunday School on this day. ​ Children's bulletins will be available by the ushers for children on these Sundays. The nursery is available during all worship services. The nursery is staffed from 9:30 am-11:30 am. Youth 6th grade on Up are invited to participate in worship each Sunday during the service. Sermon note booklets are provided weekly in the narthex for youth to fill out throughout the service. If you are visiting, youth are welcome to fill out a booklet to help focus on the text and theme of the day. Some youth choose to gather in the Youth Room (which has a comfy seating, a large white board and games) during portions of the service. These youth, usually come back to join their families in receiving communion. There is a weekly children's message during the service. Usually youth who have entered into middle school refrain from going up for the message, but are always welcome. Youth are also welcome to assist with Sunday School or the Nursery for a month at a time and during our once-a-month family service, youth often volunteer to assist with the readings or music. If our local school district is closed because of snow or cold, Holy Trinity will also cancel its programming for the same day. Please check out our Home Page for status of particular activities or events. How can I become a member at Holy Trinity? Contact the office and check out our Becoming a Member page.